The euro vs dollar continues to defy the market analysts and experts as it climbed higher once again yesterday, briefly touching USD1.3262 before pulling back to end the forex trading session as a narrow spread up candle. The issue for the markets is to attempt to determine the extent of the longest short squeeze in forex history!! From a technical perspective the outlook, in the short term, remains firmly bullish with all three shorter term moving averages pointing sharply higher. However, as outlined in yesterday’s euro vs dollar market commentary on the monthly chart we are now running into resistance from the 9 month moving average which is indeed the point at which the price action faltered in yesterday’s trading session, and, as such, could represent a critical turning point for the pair. As for the daily chart any continuation of the present move is now running into deep and sustained price congestion which starts at USD1.3200 and extends to USD1.3679 and beyond and between these two price levels we have the 200 day moving average. As such we should expect a period of sideways consolidation and even a potential pullback as the euro vs dollar decides on its ultimate path. 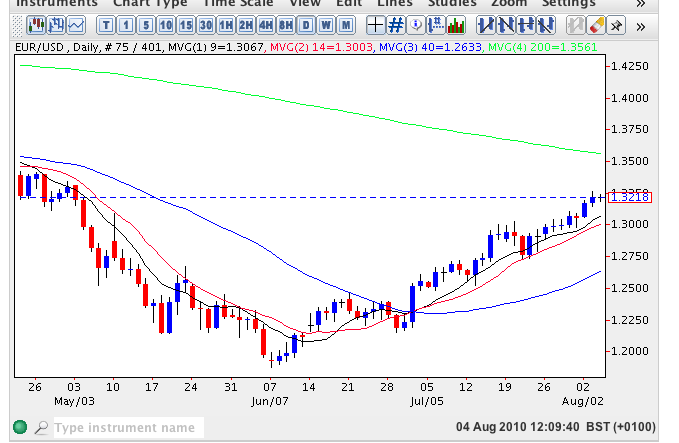 This week’s fundamental news for the euro vs dollar is now covered on my main forex trading site.